Villa Bea is a very spacious and comfortable villa with swimming pool located on the edge of the village Markovac, 2,3 km from the picturesque Visnjan where we find grocery shops, bakery, an infirmary, bank, restaurant and other useful facilities. 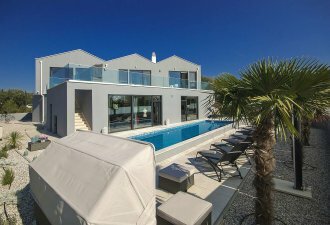 The house offers a beautiful panoramic view of the sea and on fenced plot the guests have at their disposal the following facilities: private swimming pool of 45 sqm and depth 1,8 m, covered terrace with dining table and 3 parking spaces. The house has an area of 460 sqm on three fully air-conditioned floors and is suitable for 10-12 people. In the basement of the house there is a bedroom with a separate entrance, a double bed, satellite TV and shower/toilet and a rustic tavern with fully equipped kitchen, barbecue fireplace, large dining table and access to the terrace and pool area, a separate toilet. The ground floor consits of a very large living room with sofa bed with two sleeping possibilities and a dining room, kitchen, one bedroom with a double bed, a bedroom with two single beds, bathroom/toilet with whirlpool bath and shower, a room with fitness equipment and a separate toilet. On the first floor, which is accessed by an internal staircase, there are two apartments of the same equipment consisting of a living area with a kitchen and sofa, bedroom with double bed, shower/toilet and a loggia with table and chairs and panoramic sea view.